A few nights ago, as I watched Breakfast at Tiffany's for the hundredth time, I felt particularly taken with the library scene where Paul shows Holly his book's card from the card catalog. I was instantly transported back to childhood summers at the library with my mom, flipping through the stacks of cards, searching for the perfect book to read barefoot in the grass. 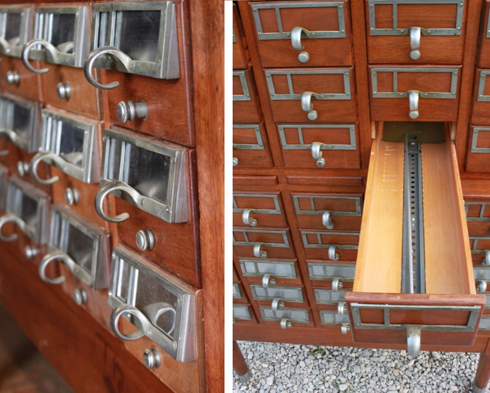 Beautiful antique card catalog used as furniture (source). 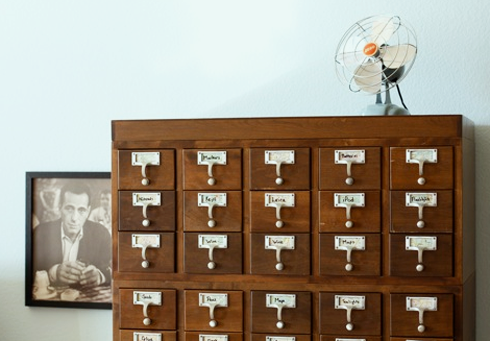 I started thinking that it would be kind of amazing to have a card catalog in my house. Can you imagine what a gorgeous piece of furniture that would make, with that pretty vintage wood and all those drawers? I did some digging online and found some lovely pieces, but they're a bit out of my price range. I guess I have a new coveted item to search for on my estate sale treasure hunts! Is tomorrow really Friday? This week has flown by. I hope your Thursday is delightful! Yes, tomorrow is really Friday (thank goodness)! I would love a card catalog in my home as well... I remember my first visit to the San Francisco Public Library. Their walls were wallpapered in old catalog cards. It was quite the sight. I haven't been there in years though, so I wonder if it has changed. 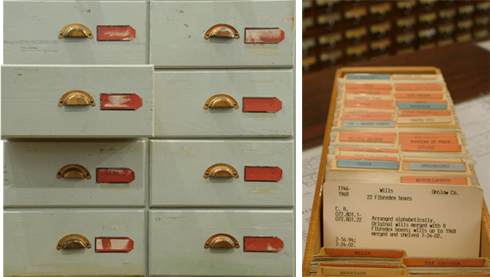 I miss card catalogs! What a wonderful idea to use them for furniture! I wonder if libraries still have some just sitting around? I love the photo of the one with the fan on top against the light blue wall... Stunning! I really like the idea of using vintage items that are now considered "obsolete" as new items. 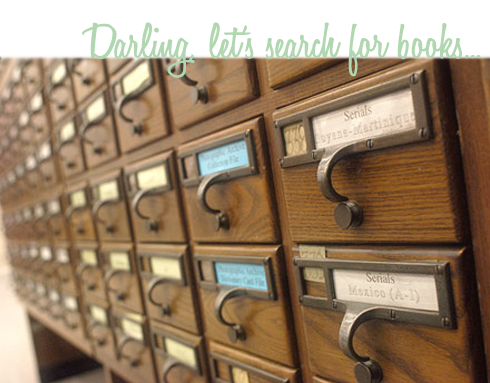 old card catalogs are soooo cool. things had so much more style back in the day. great finds. That would be such an awesoem thing to have! What would you fill yours with? Hi, new follower from EBT! Ooh my dad used to have one, I would love to get that from him someday. They are so cool! Thanks for the follow . . . your blog is great! I'm following!